For an ADD girl, day dreaming is part of my nature, but it doesn’t mean that I always have it easy. I need to let go in order to tune into the world of inspiration and listen. Walks help me on days when I feel as removed from inspiration as my dog, Dobbi (named after the cute house elf from Harry Potter) from having the common sense not to snack from the cat’s litter box. The other day I returned home after work with so many things crowding my brain, my temples throbbed. So instead of answering the call of comfort food and TV, I took Julia Cameron’s advice and stormed out with Dobbi by my side. It’s hard, at first, to let go and clear my head of all the messy clutter. But with every step I take, I feel lighter, as if I left some of the burdens down on the floor…and on some I even stomped. Then, at some point, without noticing, I forget all of the tasks and burdens and start being in the moment. I notice the things around me, and as I look, I’m rewarded with day dreams and inspiration. Suddenly, birds chirping, cars honking, construction workers drilling…aren’t an annoying noise anymore. I hear music. The wind rustles tree branches, and I see them dancing along with the tune. I see the world with layers of imagination. Trees have faces, splatters of mold on the wall have fantasy creature’s shapes. Dust twinkles under a ray of sun and transforms into a fairy. And all of this, everything around me, the silliest things, really—it all turns into inspiration for my stories. I often wonder what other people see and hear. Do you see regular trees with regular branches? Do you hear construction drills? Cars driving by? What do you see when you look at a tree leaf? Maybe it’s in the shape of a heart? Is it big enough to hold a fairy? Do you even take the time to look at the things around you? If not, please try, because maybe you’ll discover new worlds, new mysteries to explore…right here next to you in the puddle of mud that would have ruined your new shoes if you hadn’t noticed it. There’s a kind of magic in taking a first look at the things around you, and a gift in making the time to take a second look. It’s in the second look that I usually get lost in a day dream. Don’t get distracted by where you need to be or where you’d rather go. That’s too easy. Let what’s around you, or what’s stuck in your path, lead you through a different twist in the road. The world around us is the biggest art gallery ever made, just waiting to be explored. There’s no need to chase inspiration. It’s right here next to you, waiting to be noticed. And if you need help getting into a walking routine, check out Julia Cameron’s Finding Water. All of my walking poetics are inspired by her awesome book! 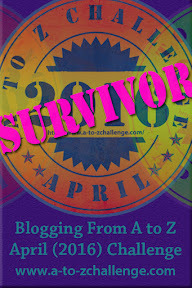 This entry was posted in Blog and tagged #atozchallenge, Inspiration, Julia Cameron. Bookmark the permalink. Day dreaming while doing something physical is a great idea. I have trouble focusing, and often find myself staring out the window until an hour passes and I’ve got nothing to show for it. But if I go for a run, that seems to focus my thoughts too. Enjoy your walks with Dobbi! My ADD brain understands this totally; the daydreaming and the anxiety over so many little things that prevents real thought. It’s not even the big things or stress that threatens to push me over the edge. It’s dealing with having 5-7 needling, yet small tasks poking at my brain and making it impossible to think about just getting them out of the way. At that point all I can ‘daydream’ about is thinking about that ever-present list of too much to do and not enough time to do it. Great post! Keep it up. Walking every day does help tremendously, you’re right! I hear you, Colleen. These long lists of tasks are a hindrance to any day dreaming, and it makes me feel as if I’m chasing a tail with ‘time’ stamped on it…er, if that makes sense. So, I also started listing the things I actually manage to get to every day, and it helps. Another from Cameron’s books. Thanks for dropping by! Great you enjoyed the post, Rachel, and thanks for dropping by!